You’re probably still pretty pissed off about The Walking Dead’s Season 6 finale, huh? You knew Negan was coming, and you knew Lucille was about to get dirty, but AMC didn’t show which member of Rick’s crew became a batting tee. Although we still have months to go until we find out who eats it on The Walking Dead, we can now rest easy knowing that the money shot will be completely worth it. Greg Nicotero has just released a video of the visual effects used for the mysterious death, and it’s glorious. Check it out below. The Walking Dead executive producer Greg Nicotero just released the above video to his Instragram account. It showcases the series’ VFX department playing around with effects for the highly anticipated Season 7 death. In the video, we see a model head rests on top of a table; a member of the team counts down and then the head suddenly explodes outward. It’s grisly, it’s gory, and we cannot wait to see how it pans out on the series. For those of you who have read Robert Kirkman’s The Walking Dead comic series, it should come as no surprise that the effect looks as gory as it does. 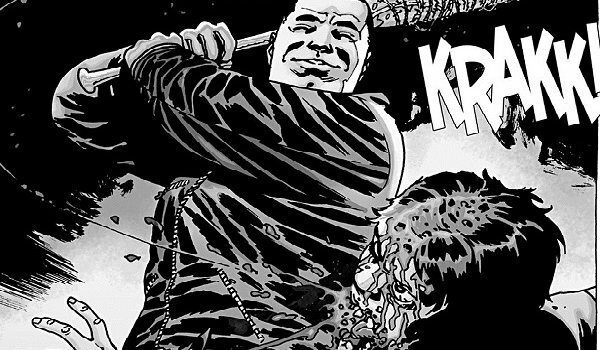 When Negan pulls this move on Glenn in the graphic novel, it plays out in a similarly violent fashion. Sadly, this video still doesn’t give us much to go on in terms of clues regarding whom Negan kills in Season 7. The dummy doesn’t actually resemble any member of the cast, so it’s clearly just a means of practicing the effect. However, considering the fact that it’s a male dummy with facial hair, it seems entirely plausible that this could provide some hints as to which member of Rick Grimes' group Negan will beat without any semblance of mercy. With that in mind, I have my money on Glenn, Daryl, or Abraham – then again, I could be totally wrong. If you haven’t checked out Greg Nicotero’s video above, be sure to give it a view. It’s disgusting and stomach churning, but that’s what we Walking Dead fans live for. Stay tuned for all of the best news related to The Walking Dead, and be sure to tune in to the Season 2 premiere of Fear The Walking Dead tomorrow night on AMC at 9 p.m. EST on AMC.